Are you planning your engagement photo shoot? 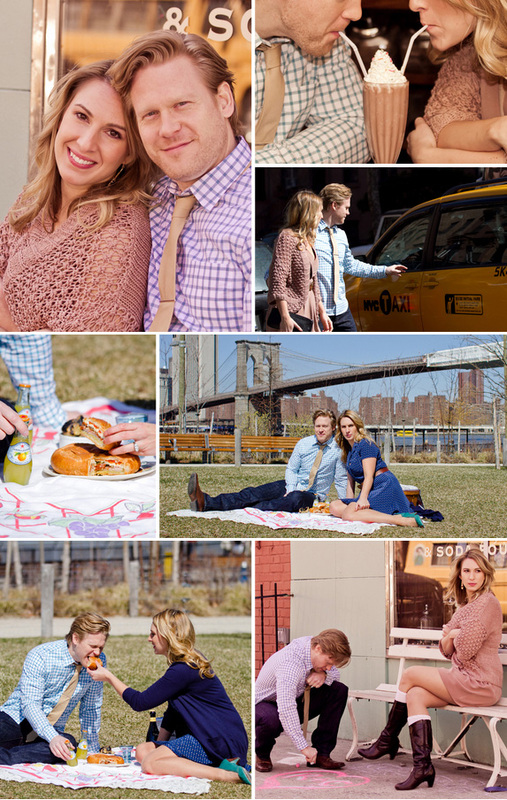 Then you have to see this fall NYC engagement photo shoot taken by the amazing wedding photographer Carmen Santorelli. I love the classic feel of the old-fashioned soda shop, and the picnic in the Brooklyn Bridge Park is so sweet! Where do you plan to have your engagement photos taken? SO excited to finally share our new website! Lela New York's Luxury Invitations site is now live and we couldn't be any happier :) Please go take a look around, and be sure to take a look at the video FAQ section where Lela is interviewed and shares her favorite invites and advice. I am loving this real NYC wedding at the Four Seasons Hotel, featuring luxury invitations by Lela New York. I love the classic red and black theme seen in the wedding decor, the bouquets and the invitations. Photographers at 5th Ave Digital did a great job at capturing special details like the couples wedding cake topper! It is so cute! What do you think? Are you loving this city chic red and black wedding? Hi all! 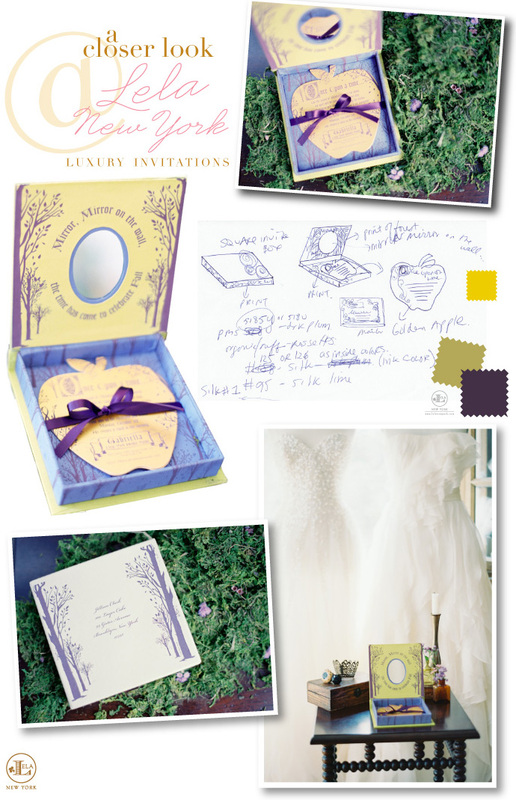 Today we wanted to share with you a closer look into the fairy-tale inspired luxury invitation designed by Lela New York! Thanksgiving is one of my favorite holidays of the year and here at Lela New York we have much to be thankful for, our friends, family and especially for all of you! It is a great time that you get to spend with the people you love and eat all types of delicious food. What could be better?! You have to check out these adorable Thanksgiving inspired cakes and treats! They would be perfect for hosting a holiday party with guests of all ages! Don't you love the adorable turkey cupcakes? And the cake with the leaves is so pretty! Happy Thanksgiving to all of you from Lela New York! When I was first asked to create the luxury invitations for a dinner party that would be inviting the top of the wedding industry, I knew it had to be unique in a big way. The theme we were going with was "Enchanted Forest" and the colors chosen were rich purples and fun golds and greens! I wanted guests to be wowed when they opened up their luxurious boxed invites and want to come to this festive celebration. I sketched out some ideas first that included initial thoughts and colors. The finish product as you can see is pretty close. I decided to use a boxed invitation that the guests can later use as a keep sake and included a real mirror on the top lid that was screen printed with the words, "Mirror, mirror on the wall, the time has come to celebrate fall." It was a great line and would immediately lead the reader to want to read further and hinted at our fairy tale theme. The actual invitation card was printed on a gold paper and die-cut into an apple shape that spoke of the Snow White character and was later repeated in the decor at the dinner party. The end result was a luxury invitation that was screen printed in deep eggplant forest patterns and boxed in a lovely box that made an amazing intro to this great event! In continuation of sharing with all of you Fairy Tale wedding inspiration, we wanted to share another important wedding detail...wedding day hair! 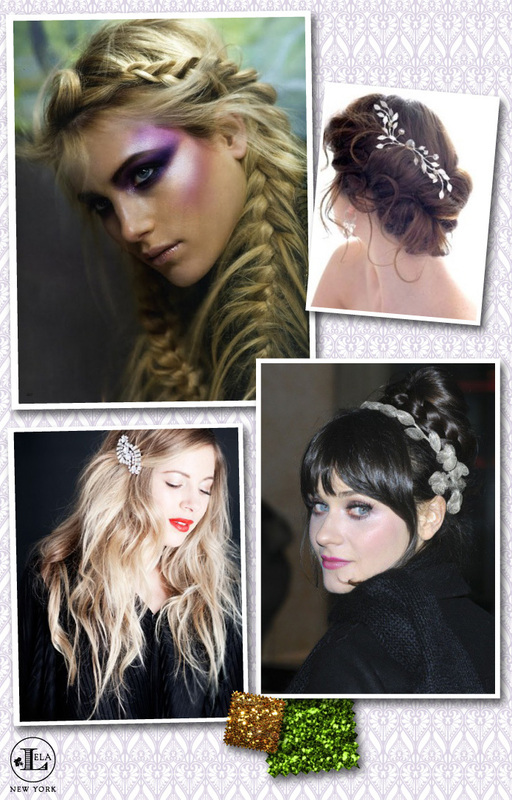 I love all of these whimsical and "enchanted" hairstyles, especially with added accessories like crystals or flowers. Also, I am loving the birdcage veil! Isn't it so pretty?! I love the look of soft, tousled curls, but the loose and "messy" boho chic updos are so feminine and glamorous. What do you think? Which style is your favorite? Fairytales and enchanted stories are everywhere you look lately. New tv shows are popping up featuring beloved fairy tale classics like ABC's Once Upon a Time and new movies are coming out soon like Snow White that showcase this Enchanted Fairytale theme. I think it's great inspiration for weddings! And who doesn't want a "happily ever after" ending to their big day?! Check out the inspiration boards below full of fairytale wedding inspiration that also includes a real dinner party event that used this enchanted forest theme. Lela New York designed the fairy tale luxury boxed invitations for the event that took place at Gabriella's Bridal Salon here in NYC. The event was designed by Ara from Rock Paper Scissors Events, the pretty flowers were provided by Round Tree Flowers and the amazing photographs were taking by Trent Bailey Photography. What do you think about this new wedding fairytale theme? 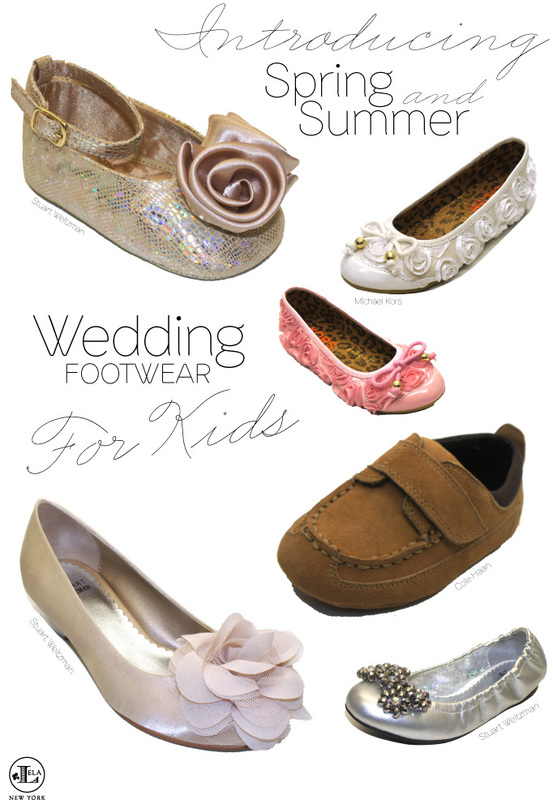 Tuesday Shoe Day | Great Wedding Shoe Styles for Kids! Great news ladies...NYC Stylist Julie Rath, founder of Rath & Co., and Julia Dalton-Brush, owner of Brush Beauty, INC. are teaming up together to bring us an amazing new radio show, J&J's Secrets of Style and Beauty. It's full of insider beauty and styling tips to help you look your very best and prepare you for your wedding day too. Make sure to check out the interview below, and be sure to tune in this upcoming Tuesday! You won't want to miss it! Read the interview with J&J & Lela below to get the scoop. J: It's called J&J Secrets of Style and Beauty, and it airs Tuesday nights at 8PM on http://talkingalternative.com. The podcast is also available for download after it airs. L: What will you be focusing on during your show? 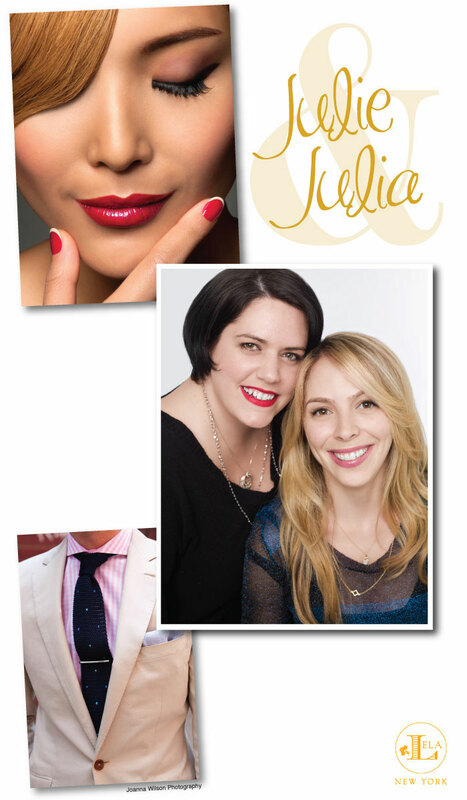 J: My cohost is Julia Dalton-Brush who’s a Makeup Artist and Beauty Editor. She and I will be talking all things style, beauty and grooming. We'll give tips and tricks for both men and women on how to look phenomenal. We'll also take live calls and tweets (@jnjstylebeauty) throughout the show. L: What can our readers expect to hear about and who can our readers expect to hear from? Will there be any special guests within the wedding industry? J: We've lined up interviews with lively and trusted experts in fields ranging from men’s and women’s fashion and hair styling, makeup, style and beauty blogging, to modeling, event planning, charity organizations, and beyond. We're super excited to have the Director of Events for David Tutera on an upcoming show, and of course the fabulous Lela will be on January 3rd as well! L: When will the first show go live? J: November 22nd at 8PM Eastern Standard Time. L: Is there anything else you would like to share with our readers? J: We're really looking to help answer peoples' questions and dilemmas during the show, so we would absolutely love for The Lela New York Wedding Blog’s readers to follow us at @jnjstylebeauty and tweet us live during the show. Also super excited to say that Lela will be on the show too, stay tuned for the date and time! Photo booths have always been a great way for both the bridal party and guests to remember and take home memories of your wedding day. But, what if you could make those pictures come to life?! 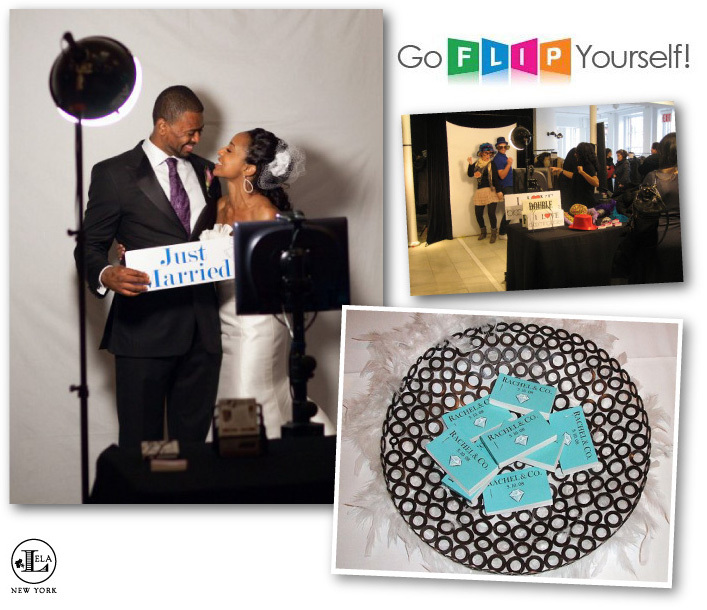 Now you can with Go Flip Yourself flip books! Your guest will have about 30 seconds to leave a video clip which is then turned into a 60 page custom flip book. This is such a fun wedding favor and we believe will be a big trend in the next wedding season! Take a look at the video below to see how flip books work. Also, be sure to check out their latest addition, the green screen flip books, which allows you to customize your background! This is such a fun idea that will be sure to wow your guests. Are you planning your engagement photo shoot? Then you HAVE to check out this absolutely adorable themed NYC engagement shoot captured by Carmen Santorelli. Inspired by Breakfast at Tiffany's, this shoot is full of style and old fashioned glamour! Don't you love it?! What do you think? Are you inspired by this city chic engagement? Have you ever seen anything so cute? Now the little ones in your bridal party can have designer shoes too! Here are the new Spring and Summer wedding shoe collections for infants, toddlers and kids featuring amazing designers such as Stuart Weitzman, Michael Kors and Cole Haan. These shoes are so adorable! I love the gold shimmery Stuart Weitzman shoes...and the tan Cole Haan's are too precious! What do you think? This is an absolutely beautiful NYC real wedding at The Plaza featuring a luxury wedding invitation designed by Lela New York. I am loving the gold, ivory and white color scheme seen in the invitations and throughout the wedding details. These hues create such an elegant and chic look. Be sure to check out their wedding cake...isn't it so pretty? Thanks to NY's Hechler Photographers for such great shots! Also, be sure to take a look at a conversation with the bride below! L: So Alana, how did Stephen pop the question? A: Christmas Morning at his parents home in Westchester. L: Who were some of your vendors? L: After all the stressful planning, what would you say was your favorite part of your wedding day? A: We were going to have pictures before the church. So the photographers planned a special moment where he would see me for the first time. We had a moment just us. L: Are there any other special moments you would like to share? A: My husband and I took dance lessons for seven months before the wedding. So besides performing our first dance I changed half way through the reception and we performed a Tango for our guests. They were so surprised they did not even know it was me at first. Another special moment was at the end when the band played the song New York, New York and my guests got in a circle and started doing an impromptu kick line with us in the middle. It was the perfect ending to a New York Fairy Tale Wedding. L: Looking back upon all the months of planning and your wedding day, do you have any advice for future brides? A: As much planning and prepping you do before hand you have to let everything go the day of. It will all work out. You need to spend your wedding day in the moment because it goes by so fast. Hi ladies! 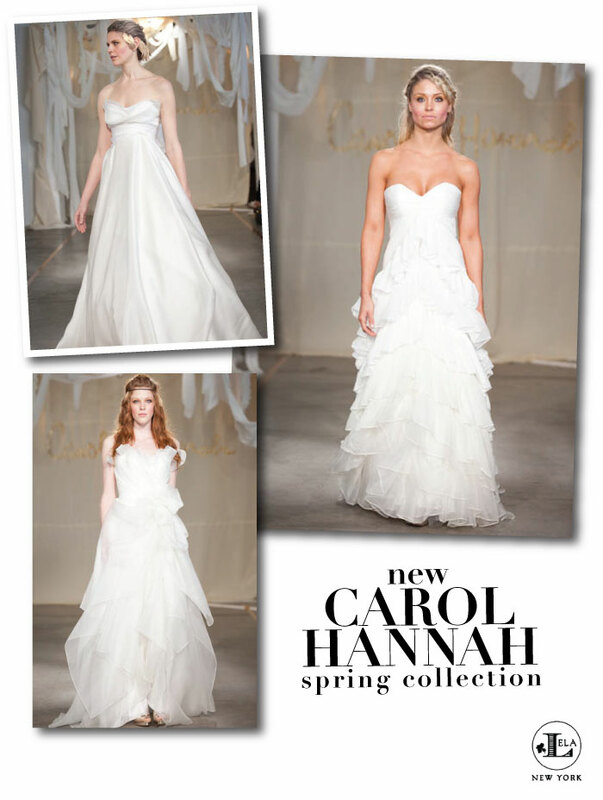 Great news, starting today NYC's Lovely Bridal Shop will be previewing Carol Hannah's new spring collection of wedding dresses. Come and check out the beautiful and chic new collection inspired by the Great Gatsby! Appointments needed through the weekend, so be sure to call now! From some of New York's finest bakeries, today we wanted to share with all of you the "sweetest" wedding detail...wedding cakes. You have to check out these heavenly coral and peachy pink wedding cakes full of ruffles, bows and sugar flowers! They are all so pretty. I love the cake with the cascading coral and pink flowers and the tiered mini cake is such a great idea for your guest! Which is your favorite? Our real wedding color inspiration for today, came from one of Lela New York's own luxury wedding invitations. I am loving this peachy palette! Paired with accents of gold and ivory makes for such a classic and chic look with the perfect pop of color. I love the cake below, designed by Brooklyn's Lael Cakes. What do you think? For your wedding colors, are you planning to have a cooler palette with the blue hues from Monday, or warm corals? Enjoy! Hi Ladies, as we all know anything and everything Louboutin is completely dreamy. 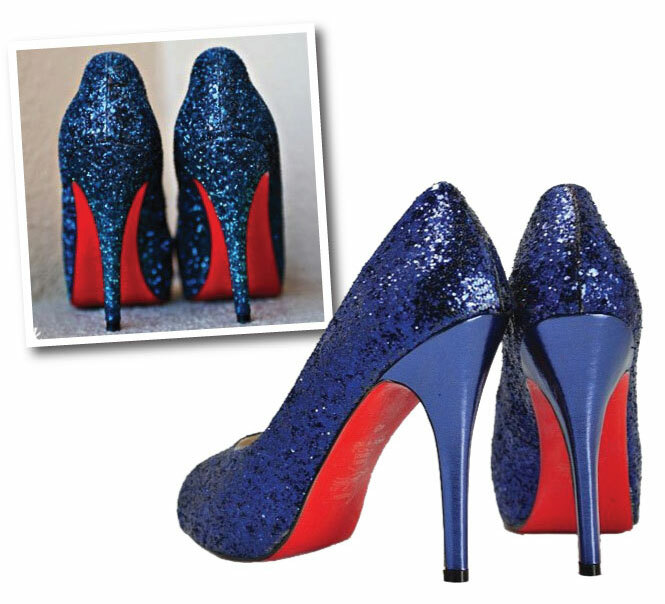 So, in continuation of bringing you wedding color inspiration, we just had to share these absolutely gorgeous Christian Louboutin blue wedding shoes. Aren't they amazing? !